1. Passing the Dream Act is about our communities and our values. America made a promise to Dreamers that if they stayed in school, graduated and got a job that they’d be safe from deportation. We do not go back on our promises. Dreamers are part of our communities. They are teachers in our schools, soldiers in our military, first responders who are there for us when we need them most. They are our neighbors, our co-workers, our classmates and our friends. Let your MOC know that this fight is personal. 2. 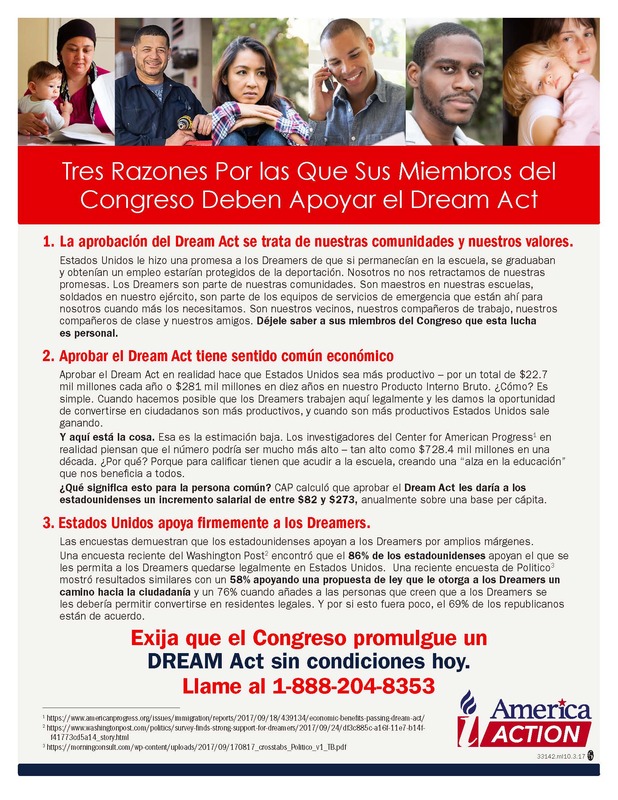 Passing the Dream Act makes good economic sense. Passing the Dream Act actually makes America more profitable—by a whopping $22.7 billion every year or $281 billion over ten years to our Gross Domestic Product. How? It’s simple. When we make it possible for Dreamers to work here legally and give them a chance to become citizens they are more productive, and when they are more productive America wins. And here’s the thing. That is the low end of the estimate. Researchers at Center for American Progress actually think the number could be much higher—as high as $728.4 billion over a decade. Why? Because to qualify they have to go to school, creating an “education bump” that benefits us all. What does this mean for the average person? CAP calculated that passing the Dream Act would give Americans a raise of anywhere between $82 and $273, annually on a per capita basis. 3. America firmly supports the Dreamers. Polls show that Americans support Dreamers by wide margins. A recent Washington Post poll found that 86% of Americans support allowing Dreamers to stay in the United States legally. A recent poll by Politico showed similar results with 58% supporting legislation that gives Dreamers a path to Citizenship and 76% when you add in people who believe that Dreamers should be allowed to become legal residents. And to top it off 69% of Republicans agree. 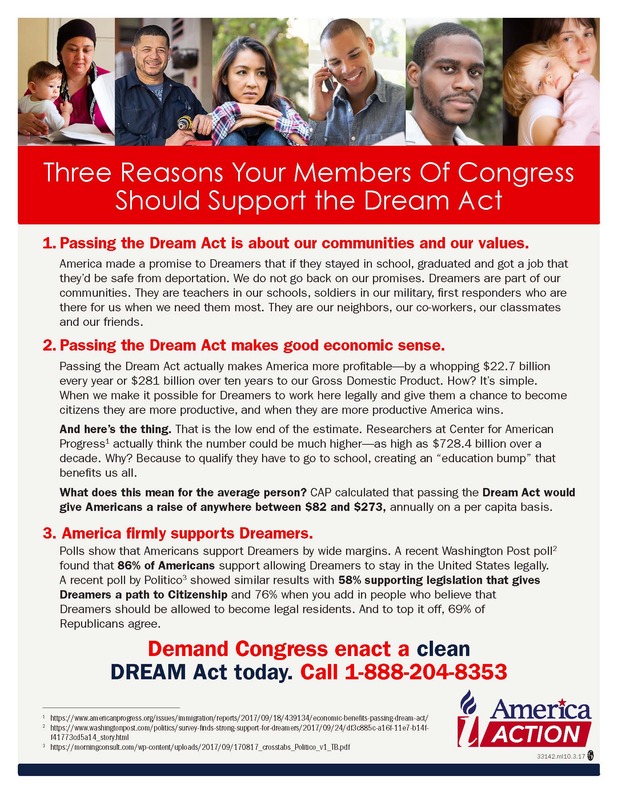 Download "3 Reasons Your MOC Should Support Dream Act"